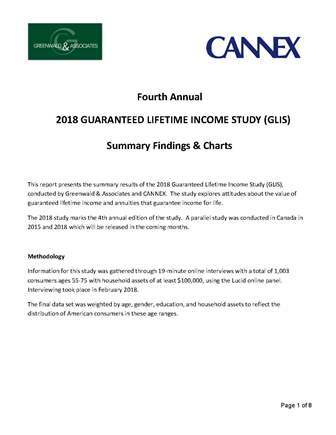 The Guaranteed Lifetime Income Study is a joint research effort by CANNEX and Greenwald & Associates and is underwritten by leading companies in the retirement industry. This study is performed annually in the U.S. market and monitors the changing attitudes of consumers toward financial products that provide guaranteed lifetime income benefits. A parallel study is also conducted in the Canadian market on a periodic basis. Ultimately the research measures how well the retirement industry is helping close any gaps in awareness and understanding of annuity products.